It has been almost one year since I nervously sat next to a crackling fire in my living room, about to be hypnotized for the first time. I was completely petrified, scared to let my psyche and willpower (or so I thought) be placed in the hands of another person. I wasn’t being hypnotized to help me quit smoking, lose weight, or gain confidence, I was experimenting with hypnosis to see if I could could bring relief to my chronic eczema, something I have suffered from since I was 18 months old. It doesn’t take a medical professional to know that hypnosis can’t magically heal cuts, rashes, and sores- it’s not witchcraft or a secret spell. However, what it can do is retrain the way your brain processes stress, whether it is every day stress or major life changes which can all impact eczema, as well as thousands of other medical conditions and symptoms. 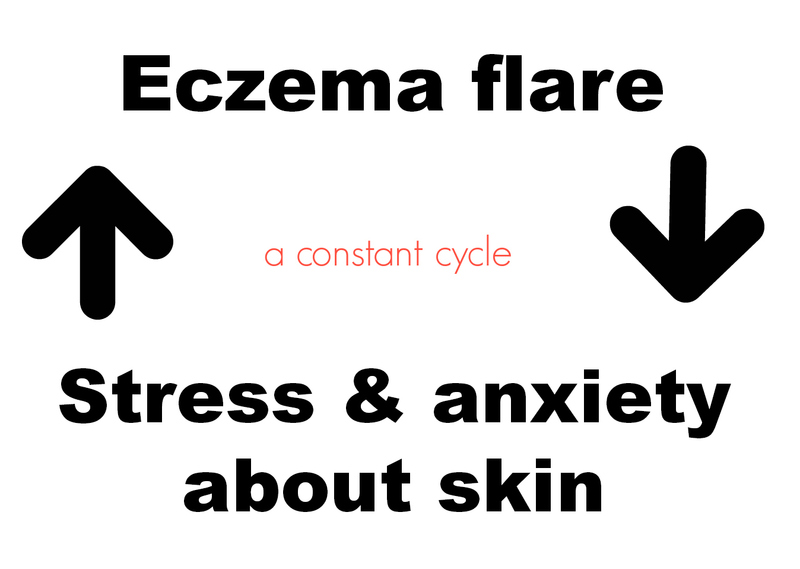 If there were a perfect definition of a “viscous cycle”, eczema would be it. You wake up one morning with a tiny rough patch of skin on your face, and you stare at it and stress about it so much that you no longer see your face in the mirror, just a hideous, red, blotchy patch of skin. You poke at it, squeeze it, and pull at it until it grows from pea-sized to quarter-sized. Others probably wouldn’t even notice it, but its all you can think about. Your head is filled with negative and anxious thoughts like “is this going to turn into a full-faced or full-bodied eczema flare?”, “How long will this one last?”, and ” Is this going to ruin my weekend plans because I can’t wear makeup and it hurts to smile?” Because you are stressing and agonizing so much, it does become the eczema flare you were so scared of. Then you stress even more because your skin looks horrible and you don’t want to leave your house, and it flares even worse. It’s a vicious cycle and a self-fulfilling prophecy. I have always been aware that my emotions and stress levels impact my eczema, but I had no idea how much they were exacerbating the problem. I would desperately try to snap out of the negative thought patterns, knowing they weren’t helping, but it wasn’t until I used hypnosis that I was finally set free from them. And my eczema has never been better. I honestly don’t believe doctors put enough stress on how detrimental our thought patterns and emotions can be on a condition like eczema. I have spent most of my life trying to figure out my triggers and at one point even believed I was allergic to THE SUN. There are absolute triggers that need to be figured out in order to help control the condition, but I wish more eczema sufferers would consider tackling their skin condition from the inside out, starting with the brain. Now when my skin is angry and in the beginning stages of a full on flare, my routine doesn’t involve staring in the mirror and feeling sorry for myself like I used to. Instead, I pop in my hypnosis CD and within seconds I am whisked away into a comfortable, stress-free, relaxing place. Make yourself comfortable in your seat, find a position that you can keep without effort and just relax your body while you listen to this tape. Keep your thoughts on my words and picture in your mind the things that I’m going to talk about. Allow my words to effect your mind and your body freely so that you can experience all the benefits from this exercise. Those words melt out of my speakers and I am instantly calm. I can feel my pulse slow down, my breathing becoming rhythmic, and my body going limp. 15 minutes later I wake up from my hypnotic state not feeling stressed about my skin, or anything for that matter. Hypnosis has allowed my subconscious to create and believe new thought patterns. Now when I have an eczema flare, my automatic response is “Oh well, it will only last a few days and it’s not like it has to change my mood or attitude. Eczema doesn’t define who I am, it doesn’t even matter.” The hypnosis CD reaches a subconscious level of my brain that I cannot tap into on my own, it has retrained my brain and the way it processes my chronic condition. And like magic, because of these new thought patterns, my skin doesn’t get worse. Within a few hours of doing the hypnosis CD, my skin feels less irritated and has visibly reduced in redness and rashiness. At first I thought it was a coincidence but it’s now been 11 months since I started the hypnosis CD for my eczema and it has been 11 months since I’ve had a bad eczema flare. My medication use has dropped down to almost none, I am able to use an over the counter moisturizer and for the first time in my life, it is enough. Sure, there are times I’ll break out and momentarily think “man, this is a bit of a bummer”, but the irritation never lasts more than 24 hours. Some eczema flares I’ve had have lasted months. It’s not a coincidence. I have nearly forgotten what it feels like to stress about my skin and that in itself is a HUGE blessing. The disease that once left bruises on my face from crying so much suddenly seems like as much of an annoyance as a paper cut. The truly wonderful thing is that I have been able to use hypnosis for ailments other than eczema. I’ve used it to improve my mood, menstrual cramps, headaches, anxiety, insomnia, and stress. Hypnosis has been such a gift to me, to my sanity, to my skin. I am so thankful that 11 months ago I went out on a limb and tried something new for a frustrating, depressing, and all-consuming condition. I have a feeling hypnosis and I have a promising future together. Can you e-mail me the name of the CD? Been having bad irritation here and there for months. Can you let me know the CD? I would love to know which CD you use too, pretty please? Been suffering from eczema since I was 2, am now 30. Have used hypnosis for other issues before and only just heard of it being used in dermatology! Fascinating! I’ve recently been having some issues with this. Could you let me in on what CD you used. I’d definitely appreciate it. Thanks so much! I am searching for a hypnosis audio like this. Can you please let me know where I can purchase the cd? I also have a daughter who could benefit from this, what is the CD called and how can I find it? Pingback: Skin problems – Can Hypnosis Really Help Skin Problems? I get so down when I can’t stop one patch turning into a horrible 3 month ordeal, so this is something I will look into for sure! Yup, itching can be a major stress release and I have no idea why. I put that together a few years ago when I would drive home from work every night and tear at my skin the WHOLE ride home. I hadn’t been itching at all up until the time I got in the car, so I know it was totally a stress release tactic I would use. Sometimes I’ll still get into an itching fit when I’m anxious about something, it’s second nature! What a great idea! I wonder how young a child can be to be successful at hypnosis or mediation like this? I’m not sure my 5yo could sit through it, but we may give it a try. Thank you so much for sharing this story! That’s an interesting thought, I’ll ask my hypnotist! I am curious about the effectiveness on young children. I have the worst skin too. I hate how if I don’t shave for a week, my face gets all blotchy, but if I shave too soon, it really hurts too. Chill out skin! I’ve used hypnosis for other things with good effect, but I’d not thought about using it for my eczema. It makes sense, though. I’ve been trying other things (e.g., diet, mindfulness meditation, moderate exercise) to try and reduce my stress response. My eczema has improved (I actually got a few months off after an 18-month flare), but I still have the attendant anxiety you describe whenever I feel the familiar itchy-burn, so perhaps hypnosis is something to look into. Thanks for sharing your experience! Since you use hypnosis already, I’m sure your body would be really quick to respond to the suggestions made about your skin while you are “under.” It would be really interesting to see though! I know what you mean, I have tried hundreds of things to ease my stress and eczema, and sometimes just trying so many things can worsen the stress and anxiety of it all! I’m so glad your 18-month flare is better, oh my word that sounds awful 😦 I swear those can cause PTSD like symptoms too! When a small patch of eczema starts to appear it’s so easy to freak out and start panicking that it’s going to happen again, and there goes the snowball effect. Hypnosis has been great to control the anxiety about it and stop it without me even trying. I know, I think about that a lot actually. In recent years I’ve become really interested and fascinated by the power of our thinking and trying to change it to make things less stressful and happier– it can do a lot. I was shown the power of our minds when I was having debilitating panic attacks nonstop every single day. When I started seeing a counselor and shifted my perspective, they stopped completely within one week and I haven’t had one since. No medication, no lifestyle changes, just a shift in mental perspective. It is truly amazing what our brains can do! Congrats! I’m so glad to hear that it has helped so much for you! I remember reading your original blog post and wondering how it would help. I think it is true, our body is just so reactive to the stress we place on it (especially those of us who suffer from anxiety and other mood disorders)…maybe I will try hypnotism one day…. Thank you so much!! Yes, it has been SUCH a blessing to find something that helps me so much both in my physical and emotional struggles, hah! Even days where my skin is 100% perfect but I’m just anxious or cranky, the hypnosis helps so much. I would definitely recommend giving it a whirl! What is your hypnosis CD called? I have a daughter who could maybe benefit from it. Hey could you let me know the name of the cd you used please? Could you please email me the name, as well? Thank you! Sure thing 🙂 on a work trip right now so it may be within the next few days. Love your blog by the way! Can’t wait to read through your posts. Very cool concept and idea.